Are you still wondering if Dead Sea Salt products are truly effective at maintaining healthy younger looking skin? The Dead Sea attracts millions of visitors seeking the miraculous skin rejuvenating benefits found exclusively in its waters. Due to the popularity of the sea’s therapeutic and healing properties, more and more companies are showing interest in the manufacturing and supplying of Dead Sea salts for body and skin care products and consumer interest is increasing for Dead Sea salt products as the popularity of natural skin products continues to grow. Dead Sea Premium Dead Sea Salt products bring you products directly from Israel, using original Dead Sea minerals, water and mud. Give it a try for major improvements in skin clarity, firmness and health. Known as Dead Sea black mud, this Dead Sea mud is a mixture of Dead Sea salts and minerals rich in magnesium, natural tar and silicates, the organic elements from the shore all blended with the earth. It is the silicates that are useful for cleansing and softening the skin resulting in a natural glow. Dead Sea mud is known to improve and stimulate blood circulation. I came across an interesting article that discussed the Dead Sea soap. It was rather informative and actually made me stop and think for a few minutes (okay, okay, I’ll come clean – seconds!). Who among us has not had problems with our skin? Skin problems are one of the most common reasons people visit doctors, and Americans spend more on their skin than they do on almost any other part of their life. As teens, almost 90% of us will get acne. As we get older, we may get eczema, psoriasis, and we all will get wrinkles one day, no matter how well we take care of our skin. Years of hard living, sun damage, and poor nutrition leaves most of us with skin issues that normal cosmetic treatments will not care of. That is one reason that more and more people are turning to Dead Sea Soap and other Dead Sea products to find relief. Products from the Dead Sea are more than just a fad. They have been around for centuries and have been used, successfully, by people from all over the world. Dead Sea Cream That Really Is From the Dead Sea! Of all the problems that go along with getting older, perhaps the one that is the most offensive to us all is the aging of our skin. Because of years of bad nutrition, excessive sun damage, and toxic air, we are all aging at a much faster pace than generations before us. We are also living longer, and in some cases, our bodies are outliving our skin. People for centuries have been going to the Dead Sea to revitalize their lives, their skin, and their muscles, so why don’t we? Even if we can’t get to the Dead Sea, we can still use dead sea anti wrinkle cream, lotions, masks, and salts that will help us bring some of our youthful spirit back. Dead Sea anti wrinkle cream is a thick, moisturizing cream used for many purposes. When a cream claims the name “Dead Sea”, it means that it either contains water and minerals from the Dead Sea itself, or uses plants that are grown in that environment. The water, which is incredibly high in minerals, is added to natural plant products to create a cream used to treat a multitude of ills and prevent the signs of aging. Here’s one to try: Swisa Sensation Dead Sea Face Firming Moisturizer. Call me crazy but I can’t stop looking for information on Dead Sea products. Then again, you know how hung up I am on this stuff and here is some info on the Dead Sea cream, not for women only. Check out this article on the benefits of Dead Sea cream…a better after shave cream. Most shaving creams benefit your skin with a good smelling and moisturized skin. Dead Sea Mineral After-Shave Moisturizing Cream is an excellent moisturizer due to the Dead Sea minerals that are included in its composition. These minerals can help sanitize your skin and provide germ protection. They also help in providing appropriate skin hydration which maintains the skin’s moisture level. Dead Sea mineral skin care products in general and after shave particularly has a benefit because of its therapeutic properties, unlike those chemical-laden skin care products, which may contain dyes, alcohol, and synthetic fragrances, causing dryness and irritation. 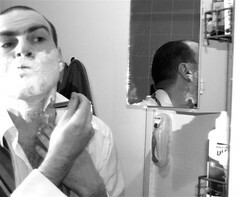 Such is the case of most shaving crèmes. Some of these Dead Sea minerals that can provide great benefits to skin and body are potassium, magnesium, calcium, zinc, bromide, chlorine, and sulfates. Magnesium which is 15 times higher in concentration in the Dead Sea can help in skin cell metabolism and also acts as an anti-allergen. Potassium helps in maintaining water balance to assist cell metabolism. Sulfur is necessary for bile secretion from the liver and for changing toxins into non-toxins. Bromine is a natural antibiotic and can help repair the body naturally. All these elements of this Dead Sea Mineral after shave combine many other benefits besides moisturizing. Through these minerals, this after shave can prevent infections that may ensue after shaving and helps restore the smooth skin texture. It also hastens healing and helps in deeply cleansing your skin, without unclogging the pores, and allowing your skin to breathe. The same minerals are also used to form a hydrating complex that ensures moisture level stability. An article by Den Seano. I hope this info is of use to you. If it isn’t, you could always check out the info here on this Dead Sea After Shave. If you have ever spent the day at a spa, you know the wonderful feeling of being coated in mud, or scrubbed with a Dead Sea scrub. Natural treatments always feel the best, and when you come out of a treatment like that, you simply feel brand new again. There are many reasons why that is so! Spa treatments are, by nature, relaxing and the products the spas use are generally much better than you use at home. If you want to re-create a spa experience in your own home, you can learn to choose products that are genuine, natural, and as good (or better!) than what you find in a spa. For instance, if you are choosing a Dead Sea scrub, there are certainly a few things you need to know. First of all, the ingredients in the scrub should be natural. If they claim to be from the Dead Sea, make sure they are. There are a lot of disingenuous companies who like to claim the ingredients are from the lowest place on earth, but they aren’t. Read the label!